In this article, we have tried to collect and organize in chronological order the most useful articles from our blog that will help to start and successfully manage your online store. Hope it will be useful for you. First things first, you have to decide what product to sell and how to evaluate the potential of your idea. Need Help Figuring Out What to Sell Online? Tip: The narrower the niche, the better. You’ll need less money for advertising, you will need less content on your site, and it will be easier to compete in the market. In the future, you can figure out what products you want to add in order to expand the niche. Should You Make, Manufacture, Wholesale or Dropship Your Product? Tip: Do NOT rely on one supplier. Ideally, have a backup option in the form of local suppliers. If your main supplier lets you down and leaves you without a product at the wrong time, then at least you will have the chance to order from another location. Getting legal is another must-do step on the road to launch. It’s also something that we’d like to avoid. The good news is that isn’t nearly as hard as you think. The first step to getting legal is to determining what the legal structure of your business will be. Registering Your eCommerce Business: LLC or Corporation? An Online Seller’s Guide to Sales Tax and Shipping in the U.S. Tip: Register your business at the start (as soon as possible). The main reason is that unless you have a properly licensed and registered business, real wholesalers won’t work with you. Besides finding a genuine item to offer on the web and registering your business, another difficult decision is deciding your business name, logo and picking a proper shipping strategy. These blog posts below will help you handle these critical tasks. How to Name Your Store? Tip: Create a logo. This is important. People will associate it with your company and subconsciously use it to distinguish you from your competitors. An online store without a logo looks unfinished and does not convey trustworthiness. Tip: If your competitors are dropping their prices, that does not mean you should do the same. Solution 1: Arrange exclusive prices with the supplier. Solution 2: Add value, and earn on accessories and service. Solution 3: Raise your prices and monitor the results. Work with two prices and two sets of products. The first price — minimum price (for example, for pick-up). The second cost is higher (for example, you bring the goods tomorrow at a convenient time for the buyer and provide an additional service). Tip: Be honest with your clients. If something went wrong with the shipping, products, packaging, etc., let them know. Anything can happen! If you can’t solve the problem quickly, admit it to the client. Do not be silent and do not attempt to hide it – that will only aggravate the situation and ruin the impression you’re making. Buyers appreciate honesty. Okay, it’s time to build your own store! There are a lot of important elements like store design, product photography and descriptions. How Much Money Do You Need to Open an Online Store? Tip: If you don’t have a website yet, nor time to create it – that’s nothing to worry about. A one-page website with an integrated online store will do the trick. Try the Ecwid starter site, or site builders like Wix, Tilda, SpaceCraft, etc. Templates are fine to start with because you can start in a day without much effort. The only thing you have to worry about is filling your store with the right products. Below we have included a rundown of our best blog posts to help you create beautiful product pages, manage your store, set up analytics for better understanding of your business. Tip: Your customer — your wealth. Love and appreciate them, solve their problems, do a little bit more than promised. Any manifestation of your kindness will return to you a hundredfold, as well as positively influence your income. Tip: Whatever promotional methods you use, the most important thing is to evaluate their effectiveness. Ideally, you should know: 1) whether your advertising is paying off; 2) how much you spend on advertising; 3) what sources provide the most traffic; 4) how to assess user behavior on your website; 5) how much you have earned. Like any business, the first few months you have a store are important, and in particular getting customers to visit your store is vital. Marketing your online store doesn’t have to be complicated. Check out our tips on some basic online marketing methods to kick-start traffic to your store. Begin to collect your customers’ email addresses from day one. Add a subscription form to your website, and send emails about promotions, products, and new arrivals. Tip: Do not chase all the rabbits at the same time. Choose one or two platforms, and focus on them. Manage your pages efficiently. Checklist: Is Your E-Commerce Store Ready for Paid Ads? You need every advantage you can get to achieve your dreams of running your own online business. 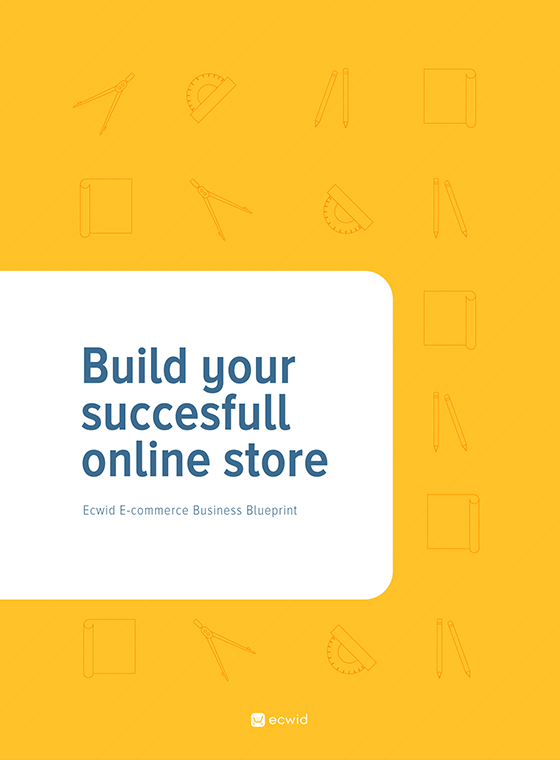 Ecwid E-commerce Blueprint can be your guide to quickly launching your e-commerce business from choosing a niche, evaluating viability, to launching and growing sales.